As more local apps are being built for wireless devices like cell phones and PDAs, one major factor that could impact continued advancement of local technology on these mobile devices is accuracy of their geolocation data. To be useful, these apps must be able to identify where the cell phone user is located in the physical world. 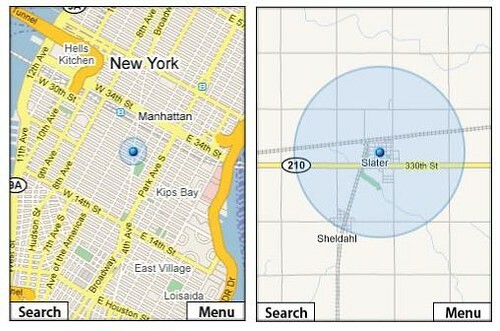 In the case of hyper-local applications, the accuracy of this geolocation data is absolutely vital to the application. So, how does the pinpointing of mobile users work, and just how accurate is it? There are two methods for pinpointing the location of cell phone users. Cell phones equipped with Global Positioning System (GPS) capability, use signals from satellites to pinpoint location very accurately. The second, and less-accurate method is often called “Cell Tower Triangulation”, referring to how the cell towers which receive a phone’s signal may be used to calculate its geophysical location. According to some industry research estimates, only about 11% of phones manufactured this year will have the GPS capability, so the remaining 89% of phones without GPS would have to depend upon “Cell Tower Triangulation” in order to disclose geolocation data for applications. Just what is Cell Tower Triangulation? In a best-case-scenario, a cell phone’s signal may be picked up by three or more cell towers, enabling the “triangulation” to work. From a geometric/mathematical standpoint, if you have the distance to an item from each of three distinct points, you can compute the approximate location of that item in relation to the three reference points. 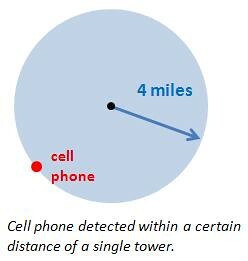 This geometric calculation applies in the case of cell phones, since we know the locations of the cell towers which receive the phone’s signal, and we can estimate the distance of the phone from each of those antennae towers, based upon the lag time between when the tower sends a ping to the phone and receives the answering ping back. In many cases, there may actually be more than three cell towers receiving a phone’s signal, allowing for even greater degrees of accuracy (although the pedantic side of me notes that the term “triangulation” isn’t really correct if you’re using more than three reference points). In densely developed, urban areas, the accuracy of cell phone pinpointing is considered to be very high because there are typically more cell towers with their signal coverage areas overlapping. 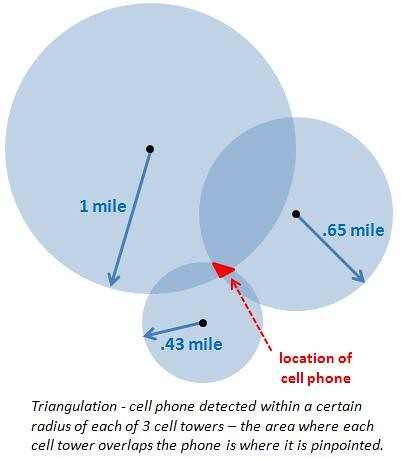 In cases where a cell user is inside large structures or underground, cell tower triangulation may be the only location pinpointing method since GPS signal may not be available. 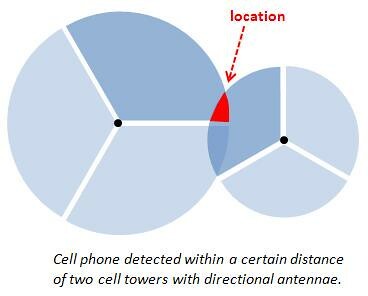 For many cell tower networks, the pinpointing accuracy may be even greater, since directional antennae may be used on the tower, and thus the direction of the cell phone’s signal might be identifiable. With the signal direction plus the distance of the phone from the cell tower, accuracy might be pretty good, even with only two towers. However, there are many places where there are fewer cell towers available, such as in the fringes of the cities and out in the country. If you have fewer than three cell towers available, pinpointing a mobile device can become a lot less precise. In cities where there are a lot more vertical structures which can be barriers to cell phone broadcasting and receiving, there have to be many more cell towers distributed in order to have good service. In the countryside, there are relatively fewer cell towers and a phone’s signal may be picked up only by a single one at much greater distance. Those areas where a phone is only getting picked up by a single tower, and if it’s equipped with only omnidirectional antennae, the accuracy becomes even less. In rural areas, coverage of the cell tower can vary from about a quarter of a mile to several miles, depending upon how many obstacles could be blocking the tower’s signal. Interestingly, Google’s Maps for mobile with My Location apparently is not using any form of calculated triangulation at all — they’re strictly using the last scenario I listed where the phone is pinpointed using only a single cell tower. Google displays a vague circle area representing the zone covered by the primary cell tower that’s in contact with the phone. Rural areas with fewer cell towers display larger locational circles while the urban areas show much smaller areas. How Will Accuracy and Precision Affect Future Apps? For many applications, the slight variations in different pinpointing methodologies may have only a relatively minor impact on the usefulness of the app. For instance, if you’re seeking coffee shops in near you, it may not matter quite as much if your location is pinpointed a little bit off. But end-user expectations have been growing tremendously, and some applications are trending towards using much more specific, more granular and precise location data — these applications are being referred to as the “hyper-local” or “micro-local” — and they may need far more accuracy in pinpointing locations. For example, an application which tracks a user’s steps as he does orienteering, or maps which give you walking path instructions to the nearest subway station — may require a very high level of specificity. Google Maps for mobile with My Location has had instances of users in large cities complaining that their location may flicker or shift rapidly from one pinpoint location to another — likely caused by them getting associated with a different cell tower as they walk near the edge of overlapping signal regions, or as cell signal fluctuates slightly. And, others have reported pinpoint inaccuracies of a number of blocks, anywhere from a quarter to half a mile. Although this My Location feature is in beta, and Google continues to improve their accuracy through heuristics and through learning more about the coverage area footprints of cell towers, one can still get a sense that user patience is short for application error. Many mobile application providers consider the current, non-GPS pinpointing methods to be “good enough”, but for how long will that perception be shared by consumers? Cell phone triangulation is often not true triangulation as we can see, but this is perhaps mitigated by the fact that the higher-density areas of businesses and interesting locations also have the higher densities of cell towers with accompanying higher pinpointing accuracy. The percentage of phones installed with GPS chips is also increasing each year, so perhaps the issue of cell phone location accuracy will become a moot point. Chris “Silver” Smith is Lead Strategist at Netconcepts. The Locals Only column appears on Mondays at Search Engine Land.